The work of abstraction is a concrete job. How is a metaphor constitutive? That is, how does a metaphor shape the reality that it describes? How, in the case of "the mind is a collection," does a way of thinking about the mind shape the mind that thinks it? 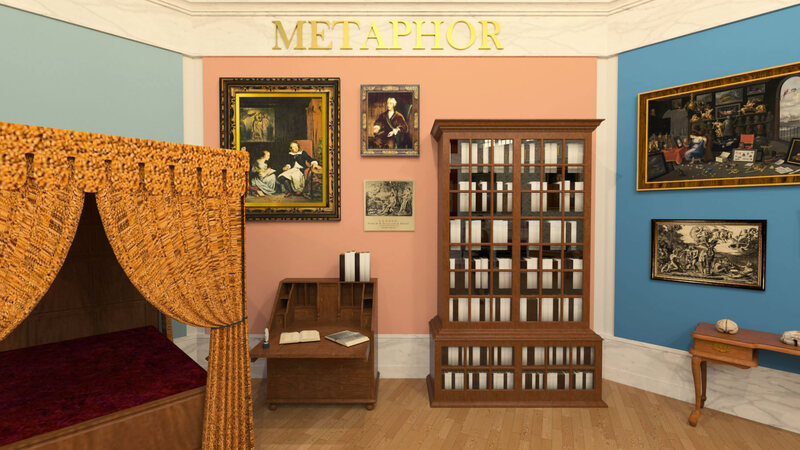 We speak of metaphor as though it were merely an ornamental expression where a literal phrase might have done just as well. We speak of it as though it were like italics, or gesture, or any sort of poetry and stagecraft; it is useful in attempting to persuade, but not affecting the underlying message. Increasingly, however, recent work has suggested that the bulk of our concepts, perhaps even all abstract meaning, is metaphorical. By this account, there is no language, nor no means of expression, that does not rely upon deeply felt metaphorical meanings. We say that we "grasp" an idea; empirical research on brainwork suggests that thinking a word like “grasp” activates many of the same areas of the brain that light up when someone actually grasps something. This appears to be true, in different ways, whether the word is thought, written, spoken, or heard, but also when something is grasped, or even when someone else is seen to be grasping something—actually or conceptually. This is a neurophysiology for metaphor, linking body to mind. Metaphor makes it possible for the brain to think in abstracts ideas. Nor was this insight lost on people in the early modern era; John Locke, John Milton, and Mark Akenside each offered versions of the claim that metaphor is the route linking language to sense, objects to ideas. This insight is the central motivation for The Mind is a Collection. An incomplete index from John Locke’s medical notebook for the years 1662–1667. Bodleian Shelfmark MS. Locke f.25. Courtesy Bodleian Library. Title page of The Museum, ed. Mark Akenside (London: Robert Dodsley, 1746). Apollo, as a figure of poetry, is seated between his inspiration and his messenger. Courtesy University of Michigan Special Collections. Notes: The epigraph is from Bruno Latour, An Inquiry into Modes of Existence. One overview of a few of the studies on the constitutive work of metaphor is in Mark Johnson, The Meaning of the Body. Most studies agree that the neurons involved during perception, visualization, and imagination include part, but not all, of those activated during overt movement. See Ellis, Questioning Consciousness; Ramachandran & Histein, “Three Laws of Qualia: What Neurology Tells Us about the Biological Functions of Consciousness"; Feldman, From Molecule to Metaphor; Feldman and S Narayanan, “Embodied Meaning in a Neural Theory of Language"; Gallese and Lakoff, “The Brain’s Concepts.” On the revivification of the dead metaphors of language, Kearns, Metaphors of Mind; Friedrich Nietzsche, “On Truth and Lies in a Nonmoral Sense.” Finally, on Locke, see his Essay Concerning Human Understanding, especially 2.2.2; Wolin, Politics and Vision: Continuity and Innovation in Western Political Thought, 265-68; Taylor, “Retrieving Realism."